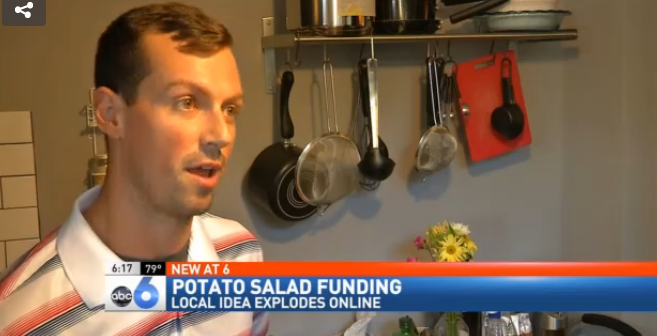 The now famous potato salad Kickstarter project closed this weekend with a total of $55,492 from 6,911 backers. 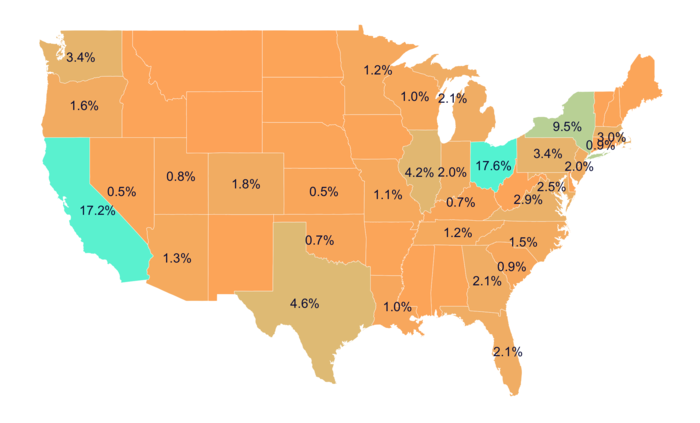 Kickstarter crunched the campaign numbers in a blog post today and found the majority of those backers came from California or Columbus, Ohio (both at just over 17 percent). Most of the money, according to Kickstarter, also came from backers who gave several times throughout the campaign and were Kickstarter veterans. Many pledges came from people who had already backed an average of 15 other Kickstarters on the site. The Atlantic broke the numbers down even further, showing that a hard-core set of just 555 potato salad enthusiasts had the biggest financial impact on the campaign. It further shows 18 people pledged over 61 percent of the campaign on the first day, possibly giving the campaign the boost it needed for all the media attention that was to come. A July 7 post in the “Offbeat” section of Reddit, just three days after the campaign started, received 4,250 upvotes, thus sparking the potato. You can see the spike in unique views right around July 7, which suggest this may have sparked the potato salad frenzy. Requests for interviews started to flood in for project creator Zack “Danger” Brown, who seemed bewildered by all the fuss on local ABC 6 station in his hometown of Columbus, Ohio. “I didn’t think it was ever going to blow up this big,” he told reporters. Kickstarter’s blog reports that the campaign only had 200 backers at this time. Brown had a pretty good sense of humor over the whole thing. He promises anyone who has pledged $1 or more that he will read their name out loud while making the potato salad. He also promised backers a pizza party as well as a giant potato salad event over Labor Day in Columbus that he’s dubbed “PotatoStock 2014.” The Columbus Clippers, Columbus’s AAA baseball team has even reached out to ask if Brown wanted to use their stadium for the party. His video updates about all the success are just the best. “Together, we’re building a movement,” he says, as a guy shoves a giant wad of potato salad in his mouth. Someone in the background then asks, “Will it change the world?” Brown replies, “Probably,” as he looks up and stares wistfully into space. Brown assumed he’d earn $60 max for the project, but now pledges to donate “a good portion” of the $55,492 proceeds to charity. “After the campaign is over (it ended Saturday), I will be contributing a significant portion of my project’s profits to a fund that I have set up at the Columbus Foundation. This will create a permanent fund to help Central Ohio’s nonprofits end hunger and homelessness,” Brown told CNBC in an op-ed. This is technically against Kickstarter’s terms of service. The rules explicitly prohibit raising money for charity. Potato Salad ended as the fourth most-viewed project in Kickstarter history with over 4 million views. Only the OUYA game console, the Pebble watch and a campaign to make “Veronica Mars” into a movie beat out Brown’s simple quest to make his first potato salad. Despite all the traffic, Kickstarter said the project received fewer pledges than anything else on a top-10 most-viewed campaigns list. Oculus Rift, for example, raised over $2.4 million, and Reading Rainbow topped out at just over $5.4 million, though both had fewer visitors than the potato salad campaign. “It’s funny to think that more people have seen the potato salad project than Oculus Rift, but hey, the Internet is a crazy place,” writes Kickstarter.